Bridge Constructor Portal takes Aperture Science lab testing to all new challenging levels. 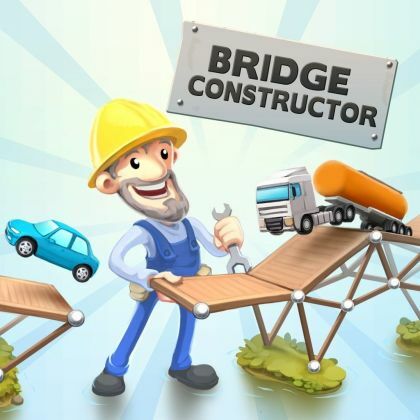 The package also includes the original Bridge Constructor and Bridge Constructor Stunts. Enter the Aperture Science Enrichment Center and experience Bridge Constructor Portal  the unique merging of the classic Portal and Bridge Constructor games. As a new employee in the Aperture Science test lab, it's your job to build bridges, ramps, slides, and other constructions in 60 test chambers and get the Bendies safely across the finish line in their vehicles. Make use of the many Portal gadgets, like portals, propulsion gel, repulsion gel, aerial faith plates, cubes, and more to bypass the sentry turrets, acid pools and laser barriers, solve switch puzzles, and make it through the test chambers unscathed. Let Ellen McLain, the original voice of GLaDOS, guide you through the tutorial, and learn all the tips and tricks that make a true Aperture Science employee. The bridge is a lie! Choose between a range of materials for each individual bridge, such as wood, steel, cables, or concrete pillars. Use the appropriate materials and stay within budget to build the perfect bridge. The choice of materials enables you to build each bridge in almost infinite variety  your budget is the only limit. The PS4 version also includes SlopeMania, a fully sized Add-On to the original game, bringing more levels, features, a new setting and much more.